Metroplex Tech is a Microsoft Certified I.T. Computer Consultancy based in DALLAS, TX. We specialize in providing IT solutions to the Small to Medium sized business sector. Implementing IT solutions within a Small Business environment can be an intimidating prospect for a business owner or operator. Many Small Businesses lack in-house IT expertise, and may need a dependable IT company to provide the best solution available. Metroplex Tech is not only Microsoft Certified but also Microsoft Small Business Specialists. We understand the needs of a Small Business, and are therefore able to determine and implement many additional value-added solutions. We have a proven track record for delivering affordable industry standard IT solutions, and are happy to provide references from satisfied customers. Our customer service is second to none which explains why we have never lost a client! As an introduction to our desktop PC and network services, we offer all our prospective clients up to 2 hrs free IT support to be used as desired. In addition to this special offer, we can carry out a completely free IT audit of your IT environment. Call Metroplex Tech today at (817) 717-5539 to request your 2 hours of free IT support, or to discuss any current or future IT plans or projects. You can also use our contact form to send us an e-mail and we'll respone to you immediately. If you are looking to upgrade to Vista, Windows Vista Home Basic, Windows Vista Home Premium, Windows Vista Business or Windows Vista Ultimate then we can help. We also upgrade other desktop PC and server operating systems, such as Windows XP or Windows Server 2003. 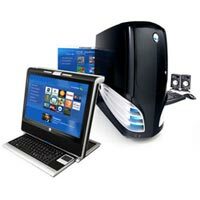 We can also upgrade CD Players/Burners, Computer Cases, Cooling Fans, DVD Players/Burners, Floppy Drives, Hard Drives, I/O Boards, PCI Cards, RAM Memory, Modems, Motherboards, Keyboards, Power Supplies, Processor Upgrades, Sound Cards, TV Tuners, USB Devices, USB Flash Drives, Video Capture, Video Cards and External storage. We have experience with all the major desktop PC and top-of-the-line server manufactures and software companies and can provide everything from a simple memory upgrade to complete system reinstall and rebuild. We also upgrade and install peripherals such as printers, scanners, cd writers etc. We are specialists with Microsoft based networks and network equipment and appliances and the latest routers and network storage devices. In addition to the server operating system we also cover email systems, such as Exchange and database servers such as MS SQL. Please contact us for more information about business PC services. Email us your contact information and we will respond back with 24 hours. Call us at (817) 717-5539 to arrange for a tech to visit your home/office. Submit a support ticket with your details and a description of the problem. Request a quote and we will send you a written quote or estimate. We travel all over the greater DFW Metroplex supporting and maintaining business computer systems 24 hours a day, so business owners and operators like you can be assured we will be there quickly when you or your computers need us most. (Service to some areas outside of the DFW, including out-of-state, may require additional travel fees.